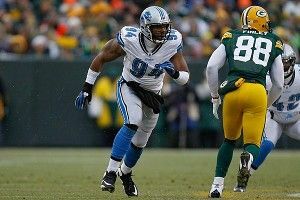 Sitting in the very front row of a packed football analytics panel at the MIT Sloan Sports Analytics Conference on Saturday was Detroit Lions’ defensive lineman Lawrence Jackson, who one day earlier had been a panelist himself. Like so many other Sloan attendees, “LoJack” showed up early, stayed late, and live-tweeted from panels. I chatted with him about his interest in the conference, how it felt to be traded from Seattle, his thoughts on the Saints’ situation, Karl Marx, and Steve Jobs. So, what made you want to come spend two days listening to stat geeks and nerds? You were on a coaching analytics panel, but you were also here all day Friday, and all day Saturday, attending tons of panels yourself. I read a report written about me on Pro Football Focus last year. They wrote a story about how there’s a difference between, say, a guy with 10-plus sacks — who, in the media and in coaching circles, is thought of as a productive pass rusher and a productive defensive lineman, even if he has way more opportunities to get those sacks — and a guy like myself who might not have as many snaps, but who on a per-snap basis is more productive. That showed me that it’s not just what you see, and it’s not just the statistics. It’s how can you get deep enough to paint a picture of what’s actually going on? I think pretty soon we’ll get into a time period where athletes will use analytics in great detail to enhance their training and their ability to execute in their sport. Do you get the sense that teams are looking at these things too? I can’t necessarily say whether or not Detroit does, because I don’t really know how they operate in their front office, but I think to some degree every team has an idea of how analytics can help them, but there’s variety in the depth. You look at what Paraag [Marathe, the 49ers COO] was saying in his panel. The depth of analytics coincides with the intelligence of the people running an organization, and whether or not this is something they feel they can adapt to and benefit from. Many sports, not just football, have kind of the macho meathead mentality where innovation is almost frowned upon. Sometimes it does seem like someone in a league front office, or a scout, can take it as almost a threat to the intellectual capital they feel they’ve accumulated over the years. As an athlete who is an intellectual, I deal with this a lot. People may feel like I might undermine whatever thought process the coaches generate. That’s not the case. Part of being intellectual is knowing that you might have a different opinion than somebody else has. You might be in a certain position of the hierarchical order or on the totem pole, and it doesn’t matter how you feel about it. I’m signing on to be an athlete and it’s almost like Karl Marx’s theory on capitalism. I am both the worker and the product. I’m choosing to be a part of this system, thus I’m choosing to be part of the conditions that are set in this system. You were drafted in the first round by Seattle in 2008 and after two seasons traded to Detroit for a sixth-round pick. Looking back, is this something that you see as a positive learning experience, or does it make you angry? At first, prior to the trade, I had made this rule in my head where if I got traded I would retire because I wouldn’t have fulfilled my contractual obligation to my team, so there would be no need for me to continue. And it was embarrassing being a first-round pick and getting traded and not having an opportunity to show my skill set. It was a huge attack on the pride and the ego. But within two hours of speaking with my family and my brother specifically and my close friends, I saw that it was the opportunity to do everything that I wanted to do. I remembered having been in the locker room and watching Detroit play against Pittsburgh in preseason. I was like, “That is the kind of defense I want to play. How come I cannot be in that defense?” Now to be there, every day, even in the dog days of camp or the middle of the season where your body’s breaking down is still like, hey, I like this. I was excited to eliminate all excuses. Being a thinker, I had been restricted by all the possibilities that can happen, the analytics of a play, so it was almost paralysis by analysis. I had an editor who always told me when I was stuck to just pretend I was writing him a casual e-mail. He knew that it would be much better on-the-fly than whatever I’d been sitting there totally overthinking. I had to learn how to move past that. I had a motto: Play, repeat, and play. You know, stop thinking, and then play. And I wrote it on my shoes: PRP. What has the experience been like in Detroit? You made the playoffs for the first time since 1999. If you go to the 2010 season, we ended up on a four-game win streak. But we started off in a slump and it was a bad stretch for two months, two and a half months. We were dealing with adversity and I think that molded our character. And it was almost symbolic of what the city was going through. You know: What would be our testimony? What would be our comeback story? Who are we going to be? What do we have to overcome? Cream always rises to the top. And we were able to finally put together everything that we had been working on, and we didn’t stray from the course of action. We believed and we believed and we believed. Water wears away the stone. It’s almost a symbiotic relationship, like New Orleans has — we need the city, we need to feed off that personality, that hunger, that vibe to continue to win. As a defensive player, do you have any reaction to the news about the Saints and their bounties? To some degree, it’s disappointing. To another, it’s not surprising. If that weren’t happening there’d be no reason to have signs posted in locker rooms that say its illegal. In college, I didn’t think it was a problem having, say, a turnover pot. You’re not rewarding somebody for inflicting pain. In that case the outcome isn’t specifically an injury. Right, the outcome is a player being more aware and more in tune to creating a good play for his team. So something like that, I don’t necessarily have a problem with. But even that’s not something you’re supposed to do in the NFL. I mean, it’s one thing to have, say, [a reward] for a turnover going into the second half of a big game. You know, it’s a one-time thing. It may be frowned upon but is that really morally wrong? Not really. But this … the time period of three years and the amount of money that they’re reporting the players offered … then that becomes a greater issue. Earlier you mentioned the work of Karl Marx. I read an interview where you referred to the Christopher McDougall book about ultramarathoners, Born to Run. It sounds like you have a broad set of interests. I have a thirst for knowledge and I feel that being so young, you don’t know what you’re going to be doing 10 or 15 years from now. There may be that one piece of information that you studied. Steve Jobs, in his Stanford commencement speech, talked about attending the calligraphy class. You never know. I found Born to Run from a flight attendant who was on the crew that we used in Seattle. She recommended it to me not knowing the injury the author had in the book was the same one I was going through where people couldn’t understand my pain. I’m generally a tough guy and that was among the most excruciating things I’ve ever felt. It was the cuboid. the cuboid is a small extra bone in your foot and all your tiny muscles connect to it and over time it can pull and accumulate until all of the sudden it breaks under the pressure. I mean, he likened it to having an ice pick stuck in your foot. I told people it was like putting the tip of a flathead screwdriver in between your fifth and fourth metatarsal. So you never know what piece of information you’re gonna to find that is going to help you in your life. Do you have any recommendations — books, movies, music, whatever — for Grantland readers? Thinking of non-traditional movies: Act of Valor, number one, and Sanctum, number two. My favorite book to this point has been Zen and the Art of Archery. With music, you know, my biggest thing is Pandora. What do you enter in for the station? I actually maximize my 100 stations limit. I like to call it “riding the Pandora wave” and seeing where it takes you. Some of my favorite stations are Seal, “Black Magic Woman” by Carlos Santana, Jimi Hendrix, Eric Clapton — when I want very high-quality blues I put on Blues in A, it’s one of his songs. Amazing, amazing station. That’s how I get my musical exposure. Lenny Kravitz is one of my favorite musical artists. His station will take you to rock and roll, to pop, to oldies, to jazz … you know, it’s one of the most incredible stations out there. The most interesting album that I’m listening to right now is The Civil Wars, it’s a duet. Of everything you heard and saw at Sloan, what will you keep thinking about? The Big 2’s and Big 3’s shows how you can put a team together that is deeper than just X number of points. How productive you can be by mixing the talent that you have. You look at Jeremy Lin, his team improved remarkably when he played. Nobody considered that he would make this drastic change for the team but he has a skill set that works with the other guys that brings out the best of them and brings value to everybody. Have you talked about the sorts of ideas that get presented at the conference with your teammates? I’ve heard Aristotle, LoJackrates, Malcolm LJ, that kind of stuff. It’s just interesting to me about being different — how in the sports world I might stand out, but in life I’m a normal person. There’s people way smarter than me. There’s people who I can’t even listen to their conversations. I studied philosophy and ended on sociology. For some reason, all the advanced courses in philosophy were offered 4:30 to 6:30, so I could never go because of football so I had to switch. Do you think the MIT Sloan Sports Analytics Conference would benefit from having more athletes’ voices on panels? I think it would. I think there’s obviously a fine line between somebody’s experience in sports and their ability to accurately and thoughtfully express the knowledge they’ve gained. As they experience more athletes that have thoughtful responses they can seek out more. I know that either as a speaker or an attendee, I look forward to coming back and experiencing this on a year-by-year basis.